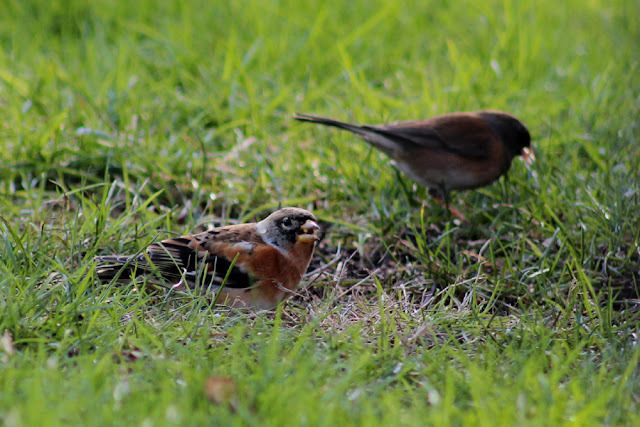 The Naturalest Naturalist: Successful Brambling Scrambling, but Sapsuckin' Ain't Easy! Successful Brambling Scrambling, but Sapsuckin' Ain't Easy! You may remember the Cattle Point Entrance Oaks Effect from November where Ian Cruickshank's sighting of a Tropical Kingbird (Tyrannus melancholicus) spurred birders to descend upon the site resulting in Steven Roias finding an Elegant Tern (Thalasseus elegans). My parodied title references the Patagonia Picnic Table Effect, but I think a new catchall title for these events on southern Vancouver Island is needed. I believe I will call them the "Ian Cruickshank is Human Effect". In these events, we realize that Ian's preternatural birding abilities are still human - he sees nearly everything but throws us a scrap to clean up every now and again. On January 9th, Ian strolled into the neighbourhood to the south of Camosun College's Lansdowne Campus during a break between classes. Naturally, the combination of luck and skill led him to a sapsucker that he felt was likely a Yellow-bellied Sapsucker (Sphyrapicus varius). The verdict is still not set in stone on this bird, but it definitely looks good for a Yellow-bellied. There are so many pitfalls in sapsucker identification due to the frequency of hybridization. Regardless of the bird's identity, birders again flocked to the scene of Ian's find. A couple of Mikes - Shepard and McGrenere - were in attendance and encountered a bird that had some features that led them to believe they had seen a Brambling (Fringilla montifringilla). The Shepard variety of Mike managed a photo of the bird in question and upon further scrutiny he confirmed it was indeed a Brambling. What an amazing rarity pair in one neighbourhood! I got back from Ontario the same day the sapsucker was discovered, but I had to wait until the weekend for a chance at catching up with the wayward duo. I rolled up to Watson St. this morning at 8:30 a.m. and a few other birders were already patrolling the neighborhood. The ground was downright frigid and the air had a chill, but I intended to stick it out until I had laid eyes on both the Yellow-bellied Sapsucker and Brambling. There was no shortage of bird activity to distract me while searching for the rarities. A couple of Peregrine Falcons (Falco peregrinus) and a rather pale Merlin (F. columbarius) - possibly a taiga bird (ssp. columbarius) - were in the area. One of the Peregrines seems to favour a big deciduous tree near the corner of Richmond Rd. and Watson St. Additionally, a Northern Shrike (Lanius excubitor) put in a brief appearance. The silence was broken just before 11:00 a.m. when Rob Gowan exclaimed "I see it... I've got the Brambling!" Those in proximity raced over, but it was too late. The sought-after Asian finch had dropped back out of view between Cochrane St. and Forrester St. The search committee waited for several minutes before a few got antsy and decided to head over to Forrester to see if it popped out on that side. Classic mistake, but luckily it didn't end in tears or night terrors. The bird flew back in to an oak in front of me and it quickly dropped down to the edge of a driveway. I managed to get David Newell, Ian, and Rob Gowan on the bird and we were able to enjoy the bird briefly before it vanished towards Watson. As I mentioned, the choice to head to Forrester St. wasn't a tick-or-cry situation. The Brambling returned time and time again for the rest of the day to the feeder in behind a house on the corner of Cochrane St. and Dean Ave. 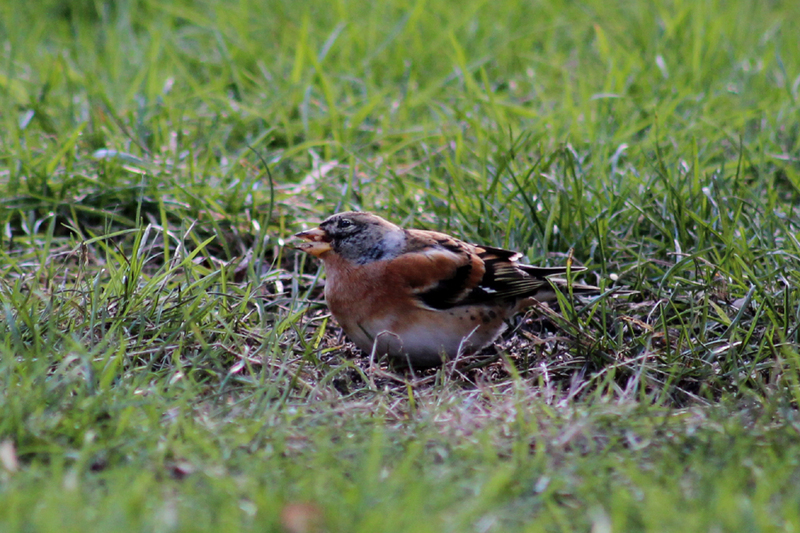 I managed a few shots of the Brambling through the fence, which I've cropped to make it look normal. The lighting was poor, but I am managed some so-so shots. This is only the second Brambling I have seen, with the first being nearly ten years ago! Any tips on aging and sexing this species is appreciated. I think the remnant grey in the hood puts this in the male camp, but is it a first-winter or after hatch-year (AHY) bird? After seeing the Brambling, the search for the Yellow-bellied Sapsucker was on. It was not to be, though. Several of us paced the streets back and forth, focusing on a few trees that have visibly been utilized by the sapsucker in the last few days. Ian started getting antsy because the sun was shining and we were just wandering back and forth, so we pooled in my car with fellow searcher, Jason Straka, for a short jaunt out towards the Ten Mile Point area. We didn't dig up anything unusual, but a stop on the corner of Queenswood Dr. and Arbutus Rd. 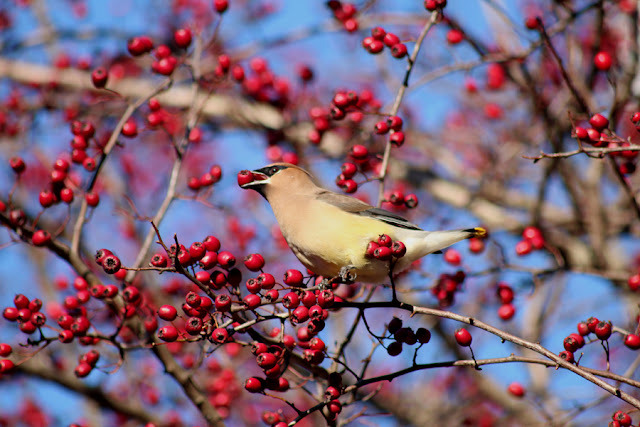 was delightfully bustling with Red Crossbills (Loxia curvirostra) in the cone-laden conifers and Cedar Waxwings (Bombycilla cedrorum) in a hawthorn loaded with fruits. The colours of this sight will warm up any soul in below-zero temperatures! After meandering our way out to Ten Mile Point, we made our way back to the rarity zone for a last ditch effort for the Yellow-bellied Sapsucker. No dice. They say that absence makes the heart grow fonder, but I'm pretty sure that doesn't apply here. I think absence makes you nervous in the birding world. I'm going to put in a short effort for the bird on Sunday and then I won't be able to try again until the next weekend. I'm wearing my BCFO hat with this request: I'd like to talk to you on the phone about a BCFO project that I'm working on that I hope you'll be interested in. Could you send me an email with you phone number, please, so that I can give you a call.